Bathua leaves (green leafy vegetable available only in winter) is very rich of iron and calcium. 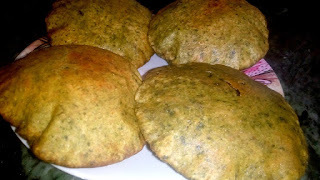 Bathua leaves in the puri dough is very helpful for me in making my puris healthy. Bathua is very good for health. Bathua puri can served as breakfast or as main course also. It is very easy to make and full of taste.